This is my second time participating in the NUOVA Festival. So I know just how much preparation needs to go into a role to be truly ready for the NUOVA experience. In order to get the most out of this program, it’s definitely best to be as prepared as you can be, not just vocally, but character-wise. Therefore, this year I’ve been preparing not just through my score, but through the play from which the opera is based. This has given me so many juicy little tidbits and additional backstory that I can’t wait to incorporate into this role! This year I plan on taking full advantage of just how many amazing teachers and mentors we get through the NUOVA program. My last experience being my first with NUOVA , I was overwhelmed by all the feedback that I think I stopped myself from being truly immersed in the NUOVA “bootcamp” experience. This is truly what makes NUOVA so attractive to a young artist like myself-- we can sometimes get so one-track with our learning that we lose perspective. Having all these informative teachers here to help us gives us just that—perspective. Sydney Clarke is a versatile and promising new talent on the classical music scene. This soprano is a recent graduate of the University of Manitoba’s Desautel Faculty of Music under the tutelage of Tracy Dahl. She is also a graduate of the Glenn Gould School of the Royal Conservatory of Music (GGS) in Toronto. This past summer, Sydney performed the role of DONNA ANNA in Manitoba Underground Opera’s (MUO) production of Mozart’s Don Giovanni. She has also performed the role of FIRST LADY in Opera Nuova’s production of Mozart’s The Magic Flute and SOPRANO 1 in Opera Nuova’s production of Terrence McNally’s play Master Class. Sydney has recently performed as the soprano soloist for the Royal Winnipeg Ballet’s staged production of Carmina Burana, by Carl Orff. 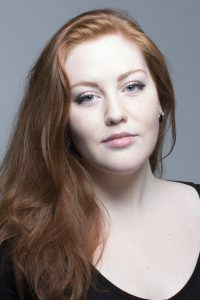 She has also performed the role of ELETTRA in MUO’s production of Idomeneo by Mozart, and was also the soloist for MTS Rising Stars’ performance of Carmina Burana with the Winnipeg Symphony Orchestra. This summer, Sydney will once again be performing at the NUOVA festival in Edmonton, playing the role of HELENA in Britten’s A Midsummer Night’s Dream. Sydney currently holds a Master of Music in Vocal Performance from the University of Manitoba’s Desautel Faculty of Music and a Bachelor Degree of Music from Thompson Rivers University in association with GGS. She is currently based in Winnipeg, Manitoba, continuing to perform and teach voice.